With the OSATS, educators now have a tool to analyze the competency of key surgical skills and develop standardized measures to track students’ progress through their training, says Assistant Professor Marco Caminiti, B.Sc., D.D.S., M.Ed., FRCD, project lead and head of the graduate specialty program in OMFS at U of T FOD, Mount Sinai and Humber River Hospitals. For its inaugural run, surgeons and trainees with varying skill levels and experience took part in the exam—from a first-year resident with no training all the way up to an expert surgeon. That was to ensure the exam differentiated among different skill levels and will help the designers fine-tune future iterations. 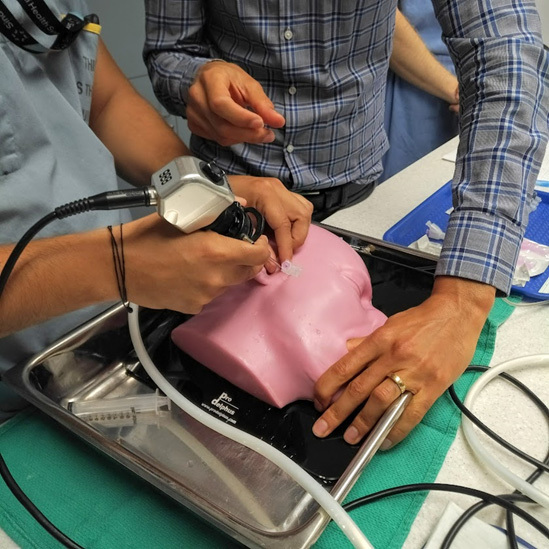 Rotating through eight stations in 15-minute increments, participants performed specific surgical tasks on models meticulously chosen for their life-like properties and were graded on their proficiency through each step. At one station, the task was to insert an arthroscopic probe into a remarkably lifelike silicon head—once the instrument was inserted, the model would actually bleed—and perform a sweep of the temporomandibular joint, simultaneously visualized on a computer screen. Other stations tested skills in tracheostomy, bending and wiring, tooth implant placement, suturing and skin harvesting, among others. “It’s an extremely valuable tool to understand where there might exist weaknesses in the programs,” which then can be used to shape and strengthen different skill modules within the curriculum, says Howard Tenenbaum, D.D.S., Ph.D., FRCD(c), Professor at the Faculty of Dentistry and Chief of Dentistry at Mount Sinai Hospital. And while the concept of the OSATS is not new—it was designed by professors at the University of Toronto’s Department of Surgery in 1998—it has not been universally adopted. It’s become a staple for some medical specialties, though, says Dr. Caminiti, “and the trend is increasing.” Having never before been applied to dentistry or OMFS, the exam’s design team hope to see the OSATS widely embraced by this branch of health education. The exam’s designers, a collaborative team from U of T FOD, Mount Sinai Hospital, Sunnybrook Hospital and Humber River Hospital, will present the results of the inaugural exam before the Canadian Academy of Oral and Maxillofacial Surgeons in spring 2019. The goal, says Dr. Caminiti, is to have the test adopted as an annual assessment tool for OMFS residents across Canada and even be used to screen candidates applying to the specialty field. Courtesy of Erin Vollick, University of Toronto Faculty of Dentistry. Photos courtesy of Dr. Marco Caminiti.